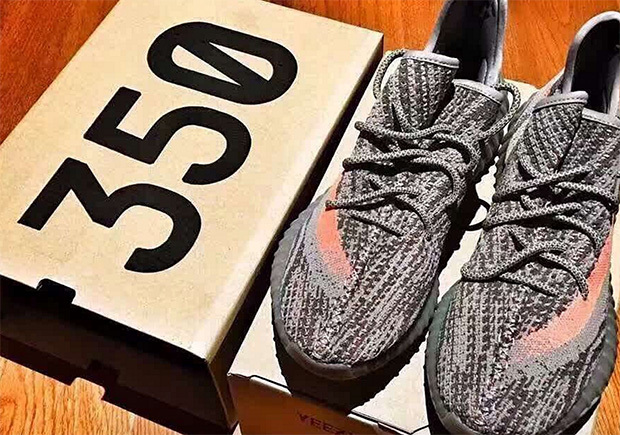 You won’t have to wait much longer for the next Yeezy Boost 350 release. Kanye’s Primeknit and Boost gem will return to retailers in early September in a head-turning array of Steel Grey, Beluga, and an aggressive Solar Red stripe on the side. We’ve yet to pin down an exact date, but rumors have pointed to September 3rd as the date to keep a close eye on. We’ve seen plenty of looks at the latest Yeezy 350 Boost V2, as it’s the first of its kind to feature the new striped edition throughout the Primeknit upper. Today we get a better preview of the updated packaging, which is rumored to be a friends-and-family only issue as it differs vastly from the subtle brown box utilized in past adidas Yeezy releases. Stay tuned for a release date regarding this upcoming Yeezy Boost 350 right here on Sneaker News and be sure to check out our exclusive video preview of the Yeezy 350 Boost “White”.